Track and Field: The Muhlenberg mens track and field team scored its best finish ever at the Centennial Conference Outdoor Championships, placing second, and two of its members were honored as top athletes at the meet: Senior Will Elson was named Most Outstanding Track Performer, and sophomore John Brodowski was named Most Outstanding Field Performer. The Mule women finished fifth. Elson won the 800 meters and the 1,500 meters, both in NCAA provisional-qualifying time, to duplicate his performance at the CC Indoor Championships in March. Brodowski won the high jump and placed second in the long jump, fifth in the javelin and seventh in the pole vault. In track events, he was sixth in the 110 hurdles and led off the 4x100-meter relay team that finished sixth. Senior Brendan Gallagher set the lone school record for the mens team, breaking his own mark in the steeplechase. For the women, freshman Danielle Seiler earned a gold medal on the final day of competition by winning the 400-meter hurdles in a school-record time. The Muhlenberg womens team broke eight school records during the meet, and Seiler, freshman Kate Isselee and sophomore Ashlie Hankee were all involved in three of them. Click here for Muhlenberg highlights. Baseball: Johns Hopkins 6, Muhlenberg 4. Muhlenbergs third attempt at a late-inning playoff miracle fell short, and sixth-ranked Johns Hopkins won its third straight Centennial Conference championship. The Blue Jays (31-5) took a 5-1 lead into the bottom of the eighth, when the Mules Matt Long and Brian LaRochelle hit back-to-back singles with one out. An RBI double by junior C.J. Kessler made it 5-2, and a wild pitch plated another run. Kessler came around on a throwing error by the Hopkins first baseman, and suddenly it was 5-4. Hopkins hit a solo home run in the top of the ninth to extend its lead to two runs. In the last of the ninth, Muhlenberg (21-14-1) got the tying runs on base on singles by senior Justin Rubenstein and Long, but the game ended on a groundout. Rubenstein had two hits in the game to set a school record with 56 on the season. A two-run homer by junior Amanda Ibey capped a four-run rally in the top of the sixth inning that lifted the Muhlenberg softball team to an 8-4 win against Gettysburg in the Centennial Conference championship game. With the victory, the Mules (14-19) captured their third CC title in four years and earned an automatic bid to the NCAA Tournament. Regional sites for the NCAAs, which begin Friday, May 9, will be announced on Monday. Ibey homered in both of the days games, although the Bullets (26-11) won the first, 5-1, to force a winner-take-all contest for the CC championship. Gettysburg drew first blood in the second game with a two-run homer over the centerfield fence in the bottom of the first. Muhlenberg, held to one hit over the first three innings, went ahead with four runs in the fourth. Four straight singles by Ibey, freshman Kristina Cartolano, junior Kate Dischino and senior Meghan Woods tied the score and put runners on second and third with nobody out. They were still there with two out when senior Kelly Berg lined a single to right-center, giving the Mules a 4-2 lead. The Bullets came back to tie the score with two runs in the bottom of the fifth. In the Muhlenberg sixth, junior Nicole Sarno led off with a single, and Berg reached on an error. The runners advanced to second and third when a return throw from the catcher to the pitcher got away, and then junior Jackie Maser hit a two-run double to right-center, giving the Mules a 6-4 lead. Ibey followed with a home run over the leftfield fence. Ibey now has three home runs in her career, and all of them have come at McDaniel in the CC playoffs. 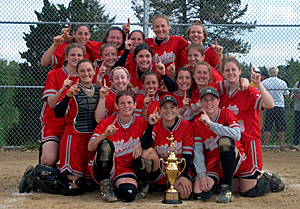 She hit .400 with six RBI in the 2003 CC tournament and is a .432 hitter in 37 career postseason at-bats. Gettysburgs leadoff batter in the sixth singled, but Woods threw her out at third base from right field. The Bullets put their first two batters on in the seventh before Cartolano retired the final three hitters to give Muhlenberg its championship. The Mules, who were the fourth seed in the four-team CC tournament, reached the NCAA Tournament after starting the season with 12 losses in the first 13 games. It will be the seventh NCAA appearance for Muhlenberg.